With August coming to an end, it's time to start thinking Christmas gifts. I went through my stash of alterable items and found some of my favorite things for making ornaments. This first one is done on Cridgeware...I stamped with my Black Archival Ink, let dry, then colored with markers. I then went back in with my Spica Glitter pens from Starving Artistamps and recolored the images to add some shimmer. The metal container I also had in my stash. I covered it with SU's Bella Rose and Holiday Treasures DSP, and added some Riding Hood Red Taffeta Ribbon. 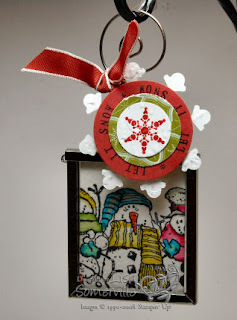 The tag is made using the Snowflake Sizzlets Die (available next week), along with the Snowburst Stamp set, my JustRite Small Letter Set, circle punches, and stickles added for some sparkle! This next ornament features many of the elements used above. The ornament can be found here. My images is stamped in Black Archival then I used the Marker Watercolor Technique (TJNL) to add color to my images. 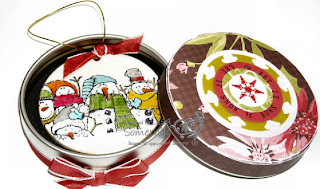 Other: Sizzix Snowflake Sizzlet Die, Spica Glitter Pens, Aquapainter, Riding Hood Red Taffeta Ribbon, Circle Punches - 3/4", 1", 1-1/4"
REALLY cute, Lisa!!! I do like the bottom one the best. :) I have to admit, that Holiday Lineup set has been speaking to me. I'm not QUITE sure what it's saying.... LOL!! Oh my lord Lisa! You make the cutest dang stuff!! I need a couple weeks of vacation so I can just make copies of your stuff. Ok, I promise not to carbon copy it but use it as a creative influence. I LOVE IT ALL! oh, Lisa, these are incredible! I LOVE THEM! Really cute. Like both of them. I don't have a tin. I'm thinking maybe a small Visqueen bag (spelling?) to hold them or give as a gift set. Your very talented. Thanks for sharing. Your work is just Great!